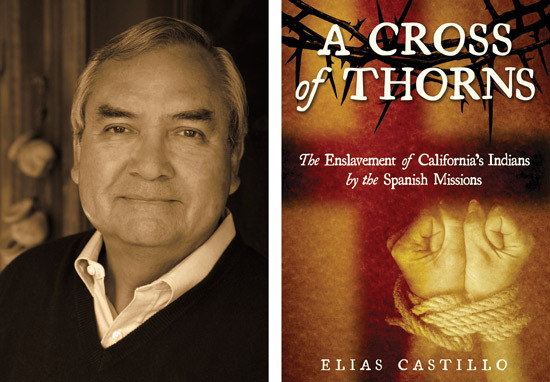 Former San Jose Mercury News reporter and alumnus Elias Castillo’s forthcoming book, A Cross of Thorns: The Enslavement of California’s Indians by the Spanish Missions (Craven Street Books),“shatters the image of California’s historic missions as idyllic sites where Franciscan friars and Indians lived in harmony,” reported the Santa Cruz Sentinel. According to Castillo’s research of letters, mission documents and scholarly works, during their 65-year existence, California’s missions were death camps where more than 60,000 enslaved Indians died and their culture was decimated. Castillo, ’63 BA Reporting and Editing, ’97 MS Mass Communications/Environmental Studies, has discussed his findings at talks hosted by the Amah Mutsun Tribal Band of Costanoan/Ohlone Indians and the State Indian Museum in Sacramento and is scheduled to speak at the San Francisco Commonwealth Club on February 9 and the Saratoga Historical Foundation on March 12. Six years after founding the first California Mission in San Diego, Friar Junípero Serra wrote a letter requesting that four Indians who had dared flee from Mission Carmel be severely whipped two or three times. That single revelatory sentence leaves no doubt of the horrors that befell the Indians that Serra and his fellow Franciscans had enticed into those first missions. What were shackles and chains doing in a mission where friars and Indians supposedly worked together in a loving atmosphere? Additionally, what authorization was given to Serra and the friars to enslave not only the Indians but also their children and their children’s offspring and impose forced labor on them? The Franciscan friar’s mandate from the Spanish king was to educate the Indians then release them. Instead, he took it upon himself to imprison them for life and use the Native Americans as forced labor. An excerpt from A Cross of Thorns: The Enslavement of California’s Indians by the Spanish Missions. Serra, Junípero. Writings of Junípero Serra Vol. IV. Letter to Gov. Fernando Rivera y Moncada, dated July, 31, 1775. Edited by Antoine Tibesar. Baltimore: Furst, 1966. p. 425.